I went to Blockbuster yesterday and got a movie, 5 liters of Coke, and 2 bags of popcorn. I still have $6 left! 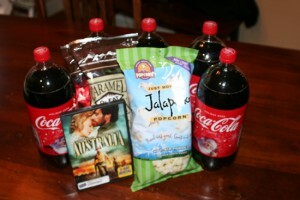 So, when I return the movie I am going to purchase 3 more liters of Coke to put in the pantry. I love to drink Coke with popcorn and pizza, but don’t purchase it a lot, because I usually don’t have a lot of wiggle room for “wants” like this in my budget. How have you been creative in using gift cards? What do you do with your drugstore prescription transfers, and rebate cards? Another option is to sell the card. There are many online sites where you can sell, auction, or trade your unused gift cards- cardavenue.com, plasticjungle.com, or even Craig’s List or eBay. I’ve never done this but have friends that have.